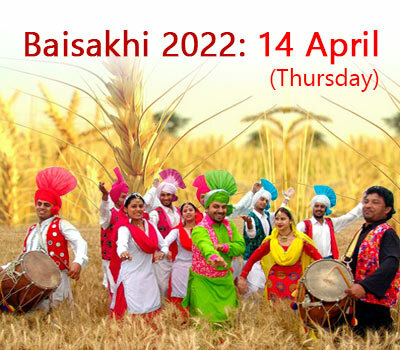 Baisakhi 2019 will be celebrated on 14 April all over India. Know more on Baisakhi date in 2019 and celebrations around the country. When is Baisakhi - Celebrated on the first day of Vaisakh month (April-May), Baisakhi is one of the most popular festivals of India. The people living in North India celebrate this harvest festival with great devotion and fun. It is also regarded as the beginning of New Year as per the Hindu Solar Calendar. According to Nanakshahi or Sikh Calendar, Baisakhi falls on the 13th April every year and April 14th once in every 36 years. The celebrations get much bigger for Sikh/Punjabi community as on this day, Khalsa or Sikh Religion was founded by Guru Gobind Singh ji.